Next Workshop: “EXIT Feeling wrong… ENTER Self-Love!”, 25 & 26 May 2019! What is the main subject of Emotional Release Workshops? Emotional Release workshops are a transformative experience during which you get the opportunity to explore your inner world, express your emotions and feelings and create a loving relationship with yourself and others. You’ll be supported to trust that there is light at the end of the emotional tunnel and to take small or big steps out of your fear-zone. The aim is to help you to open up and feel more free and happy within and with others. There is also space to work practically on your individual process with support of the group. All will happen in an appropriate and safe setting which will make you feel more understood, connected and less alone. Is this workshop something for you? – Are courageous and curious (at least for 1 day! ); not letting fear stop you from confronting emotions like anger, pain, fear and joy! Have you participated in our previous workshop? Great! You are very welcome to join again as we will use different and similar exercises during this workshop. Have you not participated in our previous workshop? Great! You are very welcome to join and experience this for yourself! If you like to get to know us before the workshop or have more information, we can arrange a skype call. First of all I would like to say a Big Thank you for your work, creativity, devotion and patience, it was just wonderful! As I have attended for the first time this kind of emotional workshop I have to recognize that at the beginning I was very nervous and feeling fear to open up especially in front of unknown people. It was challenging but the feeling of confidence came up more and more after each exercise. After the workshop I am feeling very sensitive and I have more empathy for myself and I am practicing saying No/Yes according to what I really feel. I had a great experience, especially the last exercise tickled some feelings that I didn’t want to touch for years and now I am proud with myself that I accept and embrace the pain. I would strongly recommend this workshop to my friends/ family to escape at least for one day and be themselves because there we are the way we are. Thank you again! 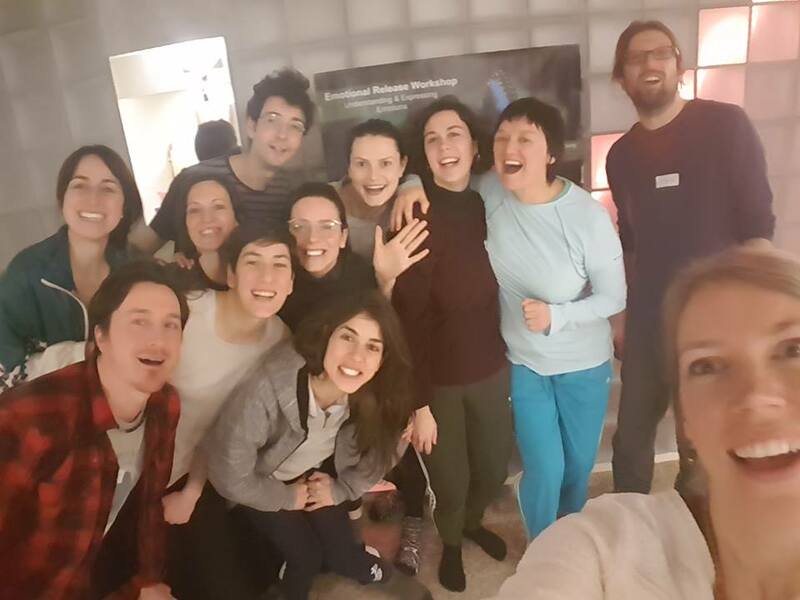 Shortly after the workshop I was taken by a lot of happiness, the exercises were very powerful! And the trust you immediately give to others in the group made me feel more open towards new friendships. It was very enriching to look at myself from a different perspective and recognize my qualities. I liked all exercises and thought they all gave me something. I can describe the workshop as a powerful experience in which a group of people assist each other in opening up their hearts and embracing their emotions! It was an intense experience. I couldn't imagine all those exercises had so much power. I never worked with my body and sometimes I had some difficulties to listen to my breath and my phisical being. I loved 2 exercises in particular. I liked the last exercise about receiving love because I'm used to receive negative comments from my family and when I listened to your positive words about me I said "So I am worth!" and every day these words are driving me and I feel stronger. The other exercise I liked was that about telling the key episode in which I lost trust in myself and It was very useful to visualize that situation and that person to release my feelings. It was a unique experience focused on the body to express inner feelings and deep emotions. Since I Did The Workshop I am feeling tired, like everything was shaken up yet, at the same time, I am feeling a realignment of body, speech, mind and feelings. I feel the foundation of confidence opening up and I see better through old patterns that hold me back. The Workshop Was heart-touching and awesome - the best gift I gave to myself! It helped me to overcome fear and provided life tools to take with me into the world. It was an intense day, well spent, and you walk away feeling liberated and well equipped to move forward with confidence in life. I recommend both Somesh and Tessa, their compassionate approach and guidance allows one to feel safe and one can relax and open up and explore his/her own obstacles in a playful way regaining trust in yourself and others. I loved the workshop! It was impressive, a mixture of sensations/emotions, sometimes divergent: intimidating, liberating, tough, physical, intimate, relaxing and extremely powerful. I have to say I unexpectedly changed mind approach on a current personal matter that has been troubling me for a few months. The workshop helped me processing the dynamics in a way I had not try before. Now I feel I would like to do another workshop again. Thank you very much again for this wonderful experience. I gained new insights about myself and I came to a place of peace. I felt a lot of love and peace after the workshop. The group and the setting made me feel safe to open up and to be myself. I associate being vulnerable with a positive experience and feeling now. To tell to strangers about my fears and sharing my feelings gave me a different perspective on them. I saw how much these parts of me want just to be loved. I really enjoyed all exercises. It felt so safe to open up and be vulnerable being part of a group. I understood that we all have similar fears within ourselves, this is refreshing and makes me feel less alone. We were all bonding and with love and trust facing our wounds together. Thank you so much. I am deeply grateful. The duration of the workshop was good and the location is amazing! My favorite exercise was the tunnel of love, it was so emotional. Overall, I had a very good experience, I liked the guidance and when I wasn't feeling good you were able to help me so good. Thank you! I loved the fact that a group consisting of some people that were apprehensive in the beginning opened up so much and started to express themselves to such an extent that even silence didn't feel awkward anymore. Furthermore the support by Somesh and Tessa was really good in that they complemented one another in a perfect way to guide the group dynamic so that everyone was able to get as much as possible out of the workshop. It was a great experience, it was for me the second time and it was different than the first one. It is an experience that helps me in being more conscious about my emotion and less scared. If i have to compare my first and my second time, I can say that I lived the second one with more calm and with an open heart and less fear. And, in opening my heart to this amazing and sweet group, I have learned that inside all of us there is a wonderful universe that needs to be respected and loved and that I want to do that for myself and to others. It has been a recharging experience because I don't get the chance or the opportunity to talk about my emotions to my friends, partners, family etc. The exercises helped me in understanding what my feelings actually are and how to accept them. It was a pleasure and a really useful day of deep connection and listening, my participation to this workshop. I really loved the structure and the way you set it in the different part of the day. Connecting in the morning, explosion in the afternoon, deepening and reconstruction at the end. It was really following the day and the energy! Beautiful! You helped each of us with your experience, your knowledge, your creativity and your real gift, your heart. I really love you guys for this! The workshop was amazing! I have never had such a great experience in my life and now I really feel free and able to express who I am and what I really want from my life. I really loved the fact to be there for an entire day with unknown people sharing my deepest feelings. I realized that I am not the only one suffering and this opportunity was perfect to understand that there can be a light at the end of the tunnel and I can finally be happy and free. Sometimes I see obstacles bigger than they really are in reality and I cannot be free because I am always afraid of the judgement of the other people. I definitely will join the next workshops, this way is really helpful for me to overcome my problems. Overall, I enjoyed the experience more than I thought. I have a lot of resistance to these type of workshops as they become too touchy/feely and put me more into overwhelm, which leads to the desire to escape. I was able to stay present, connect to those around me and felt comfortable. So, pleasantly surprised. I appreciated the container held by Somesh and Tessa, which allowed for choices without feeling pressured. The dynamics of the group were nice. Even though I didn’t feel a lot of sadness come up during the day that evening my body felt like had just had a really long cry so definitely experienced a release of held emotions. I also had the best sleep in a really really long time. I actually rested. It was a very positive experience for me. I could “read” inside myself, make some order and relax. I was able to experience the feelings of others and understand which ones touched me the most. I realized which feelings were more difficult for me to express. I understood that for me it's easier to express and experience sadness and joy, but not easy at all to do the same with anger and fear. The experience was great, it left me wordless, at the begin I was pretty skeptical because I never had an experience like that. It has been a mix of fear ,curiosity and doubt . The first thing I thought it was that there was no need to wear any mask or defense because I went there for myself and I didn’t care about to appear, my only intention was to be in contact with my emotions and other people, and I was glad to see that it was a common intention. At the end of the day I honestly felt full of relaxing energy, my soul and body were warm, and as a sleepless person I can say that I slept like a "stone". Tessa and Somesh made me feel fully relaxed and safe , I felt free to decide if I wanted or not to follow an exercise and I think it was cool that they did with us all exercises. My conclusion is that it's an experience that I recommend and I’ll do it again for sure again! It was really intense and demanding. However, I enjoyed the workshop very much! It had a beneficial influence on many aspects of my life. Moreover, it was nice to listen to other people's experience. Some have similar experiences to mine, others do not. I found both things very interesting and instructive. I discovered many things I didn't know about myself and I do think there are still many aspects of my emotions I do not know. Thank you! I'm pleased to have attended - I looked forward to this workshop for a number of reasons : to place myself and my own perception of what is going on in my head and body in reality with other people and to see if there is a recognition with others. To beat the pillow with a stick and then, more importantly, to get feedback about how to approach, execute and then allow the activity to finish in its own time was for me the best exercise. Thanks the emotional release sessions, I'm doing very well at the moment. I regularly do the exercises that you've given me and your therapy has helped me a lot. I've also given your information to my company doctor to forward others to you. I am working full time again and have taken up all my tasks again. Thanks a lot! The location is great. Easy accessible and gives a very homey/safe impression and the duration of the workshop is just right. I have to say that both of the times I attended this workshop, I was quite astonished how late it was when leaving the place. It is a very nice sensation of flowing time! I felt the exercices made-to-measure: a good balance between more confrontational (and therefore more uncomfortable) ones and less confrontational ones. I am really glad I have joined both the workshops and definitely looking forward to the next one! The location is very nice, warm and I always feel protected. I liked most the exercise we did at the end, where everybody were receiving/giving compliments to the others. At the beginning I was sure would be hard for me to have another strong experience at the third emotional release workshop but I was wrong because I was able to get connected with myself in the same way as the other times. I really like the exercise where we danced in a free way! I really liked the workshop, it was intimate and inspiring. During the exercise in which we were looking at our partner, projecting on him the person we wanted to confront, I could express my deep emotions, and it was an experience that helped a lot. At the beginning I was so angry, a fury, and I could finally find my own way to express it. After that, everything changed: I felt love, relaxed and open, it was a surprise for me! I felt much more love for others and for the group. Thank you! The location is great. I like the atmosphere and the room is perfect. The duration was also perfect but I'd also like a longer workshop. The best part for me was the main exercise, in which I was sitting in front of someone who represented my father. I was able to release what I was feeling and I felt like he was really sitting there! For me this was a good experience, I was able to let go and release my emotions. It was liberating and inspiring. I loved it because it was a beautiful and active workshop and I also loved the music and the togetherness. The way (Tessa and Somesh) have guided us is great! They are natural and honest. I felt refreshed after the day, I felt more space in my body and I felt more energized, free and present. It was perfect for me and I achieved what I wanted. The location is perfect for the workshop, I really liked. I liked the exercise where we were divided in two groups and we experienced different ways to deal emotionally with our life situations (acceptor VS rejector). I found very hard to let some emotions "become voice", but after that I was surprise by the fact that I was able to get rid of a lot of shame around my sadness. Thank you! It was a great experience for me, especially realize that everyone carries some emotional burden made feel accepted. I felt a connection that allowed me to share my personal story. The main exercise was a rare opportunity for me to genuinely express any emotions I felt without being bothered by anything outside of myself. In addition to this, I found it great to have the chance- feel safe to- and be encouraged to speak out any issue. It was good to have also extra opportunities at the end for evaluation and expressing issues that came up. My overall experience was good. It was very deep and moving. Going outside my confort zone was, indeed, very challenging. I understand that I have much more to release than I think! I liked the moments with talking and sharing both in the group and with one partner. To me was hard to express in a direct way my negative emotions, I am not used to it because I have the tendency to keep them inside instead of release them. However, I can understand how useful it is. It was an interesting experience. I felt a nice connection with the team and for the most part of the workshop I felt very 'present'. I thought there was a nice balance of bioenergetics exercises, meditation and emotional exercises, and the dance at the end was very reviving and in my opinion a perfect way to end the workshop. I also think that the therapists did a good job at keeping a balance between showing us that we can express/disclose as much as we want (or don't want) but also 'pushing us' in a positive way to let go of some resistances. "It was a very intense afternoon and I found sharing experiences and pain with the group very valuable and memorable. I would like to work more with this group and see how we can all progress on solving our emotional traumas and personal issues together. It is always cathartic to know that you are not alone in suffering and that there are many others in similar situations and dealing with similar issues to yourself. This helps bring perspective and a sense of belonging, which is very supportive and beneficial. I hope the others felt the same way. The workshop ended on a very positive and affirming note and I found this very beautiful." "I had a great experience overall and for many reasons. It was a great and respectful group of people and, it is my impression, everyone felt respected and safe to open up with the group. Condition extremely necessary given the work being performed. The activities was various and a good mix of heavier and lighter ones on which I enjoyed taking part, or felt challenged just right. Also very beneficial was to see how people feel and are dealing with similar issues and emotions." "The overall experience was good. I was glad to meet so many people who were nervous at first like me but then really opened up to trusting each other and being with each other and it was good to find out about their problems and I saw myself in many of those people , I think we had some similar problems. And then the exercises flowed quite naturally and we were always asked if everything was fine so everyone went along with everything which was good. I would go again for sure. " "It was good to hear and listen (!) all the different stories. I personally got triggered while a lady was talking in the beginning. I just felt my tears dropping and pain producing sort of pain thru my chest. It was clearly related to my 1st separation. The workshop was worth every minute from 2 to 6pm despite the good weather outside. *:) happy"
Reservation: Due to a limited number of places available, you need to book this workshop in advance. To reserve a place, please complete the following contact form. After that, you will be requested to make the payment. After the payment has been made, your subscription for the workshop is confirmed. Please note: Wear comfortable clothes, or bring a change of clothes, your own lunch and a bottle of water.